Wonderful news for the 2016 CSW High School Chemistry Olympiad! 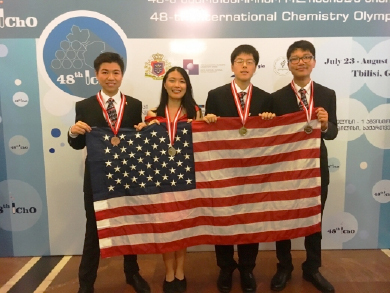 For the second sequential year, one of our local students not only attended the Study Camp, but was a member of the U.S. team that participated in the International Chemistry Olympiad in Tbilisi, Georgia. Also, four students earned High Honors by placing among the top 52 scores on the National Olympiad Examination. Read on; details later. The U.S. High School Chemistry Olympiad is an annual program for high school students that has been organized by the American Chemical Society (ACS) since 1984. The CSW is proud to have participated in this Olympiad each year. The CSW conducts its Chemistry Olympiad at two levels; the first level is the Local Section examination in March, and the second level is the U.S. National examination in the latter half of April. For the National exam, ACS allotted the CSW twenty student places with the rule that a maximum of two students can be from one school. The Local Section examination purchased from ACS was used to select these 20 students, and we work with the high school chemistry teachers for this purpose. E-mails were sent to teachers asking for the nomination of up to twenty students to take the Local Section exam, which is a multiple choice exam of 60 questions. Teachers from thirteen high schools nominated a total of 133 students. Seven of the high schools are in Maryland, five are in Virginia, and one, a new charter school, is in Washington, D.C. The teachers administered the Local Section Exam to their students and returned the answer sheets to the CSW Coordinator (Regina Cody) for grading with the answer key from ACS. From the results of this exam, the 20 students were selected to take the National Exam for the CSW. All the students who took the Local Section Exam received Certificates of Participation, as did their teachers. Those students who scored 40 or above received Certificates of Honors (40-49) or High Honors (50-60). The National Exam was given on April 22nd in the Bioscience Education Center at the Germantown Campus of Montgomery College. This exam consisted of three separate parts, one written multiple choice, one written essay response, and one laboratory practical, and was given in the same time period, April 19-25, across the U.S. to about 1000 students. The ACS had a separate grading site and team to grade the National exam. Joyce Tian from Thomas Jefferson High School for Science and Technology in Alexandria, VA was among the 20 students who qualified for and attended the Olympiad Study Camp held at the University of Mary Washington in Fredericksburg, VA May 31 – June 15. Toward the end of the Study Camp, Ms. Tian was selected as a member of the 2016 U.S. Alpha Iota Team to participate in the 48th International Chemistry Olympiad held July 23-August 1 in Tbilisi, Georgia, and she earned a silver medal. Joyce, congratulations on a very successful Olympiad! The other three members of the U.S. team were Alex Liu of The Village School, TX, who won the eighth highest ranking gold medal, Kevin Tang of Solon High School, OH, who also won a silver medal, and Zilu Pan from Canyon Crest Academy, CA, who won a bronze medal. The U.S. Team competed against 260 students from 66 countries. The twenty students who took the U. S. National Exam for the CSW are listed below along with their teachers and high schools. These students received ACS Certificates of Participation. 2016 U.S. Alpha Iota Team: Left to Right: Zilu Pan, Joyce Tian, Alex Liu; Kevin Tang. Previous post CSW’s Project SEED Program Still Going Strong!